ZipCrank Adjustable Height Shooting Station by Bison, Inc. 54" or 60" Tempered Glass Backboard. WALL MOUNT ADJUSTABLE SYSTEM WITH YOUR CHOICE OF A CLEAR GLASS OR SMOKED GLASS BACKBOARD. Clear Glass for a traditional look or Smoked Glass to cut glare and help hide ball marks. Institutional Grade. Available in a 60" Backboard ($99 upgrade). 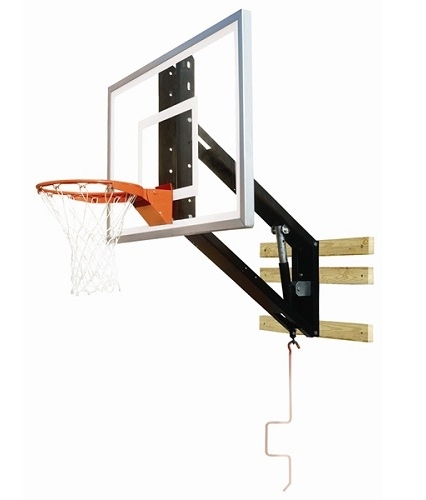 This system is a great option for mounting a hoop over the garage or on a wall. Can be used both indoors and outdoors. Shop around and compare these features. BACKBOARD: 54" X 36" in your choice of 3/8" Tempered Glass OR 3/8" Smoked Tempered Glass OR Upgrade to a 60" X 36" Glass Backboard for only $99.00 (select above). 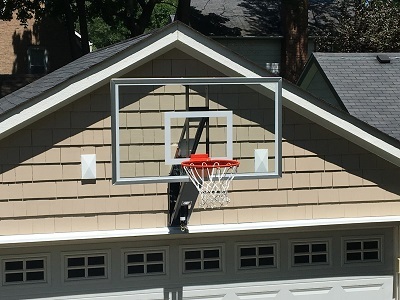 The backboards, both glass and acrylic have a lifetime warranty against breakage during dunking because the rim is bolted directly to the frame of the system and not to the backboard. You don't have to worry if someone hangs on the rim. ADJUSTABLE ARM: ZipCrank adjustable extension arm with 32" of extension from the wall. The hoop is easily adjusted from the front using Bison's time proven ZipCrank adjustment mechanism. Adjusts from 7 1/2' to 10'. The arm can be mounted to most wall types using 3 load spreading struts. The struts are included. Please call us if you have any mounting questions! BREAKAWAY RIM: Institutional Grade NBA style breakaway goal with Bison's continuous-wire net attachment system, no plastic net clips on this rim. This is the same rim Bison's has sold to thousands of schools and colleges world wide, it's the real thing. Shown with 60" Clear Glass. Need more than one? Call or email us for incredible discounts on multi-unit purchases. We proudly use ABF Freight System, Inc. to ship our basketball hoops. North America's most trusted carrier, they provide our customers with Award Winning curb side service throughout the US and Canada. Free Lift Gate Service is provided where required. Shipping Weight 215 lbs. in 4 cartons.